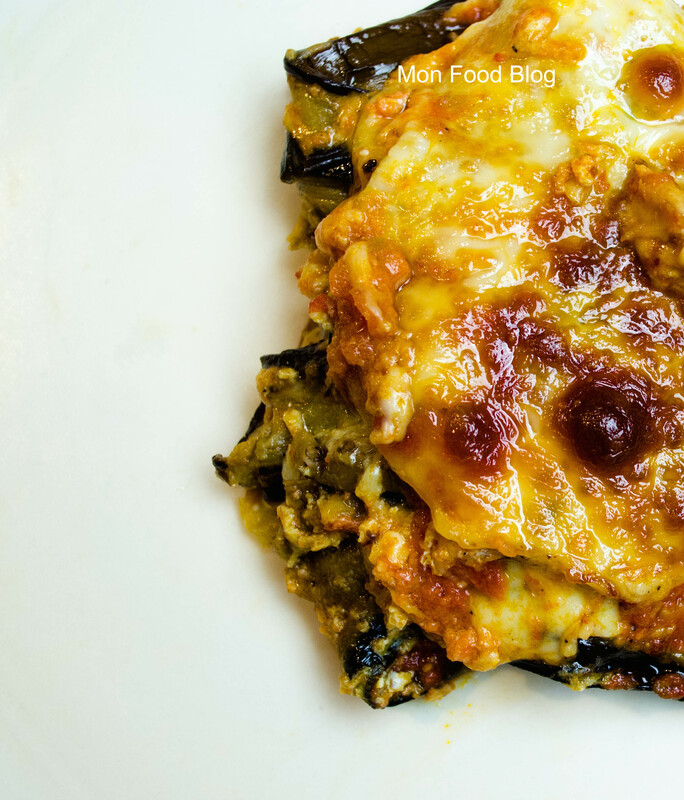 I just love a classic eggplant parmigiana made with breaded and deep-fried eggplant slices, then layered and baked with tomato sauce and lots of cheese. if done correctly, the eggplant remains crispy, and it just delightful. And also very rich and caloric. So this is my version of winter eggplant parmigiana, a lighter version which omits breading and deep-frying, but keeps the intense brown flavour that I love so much. 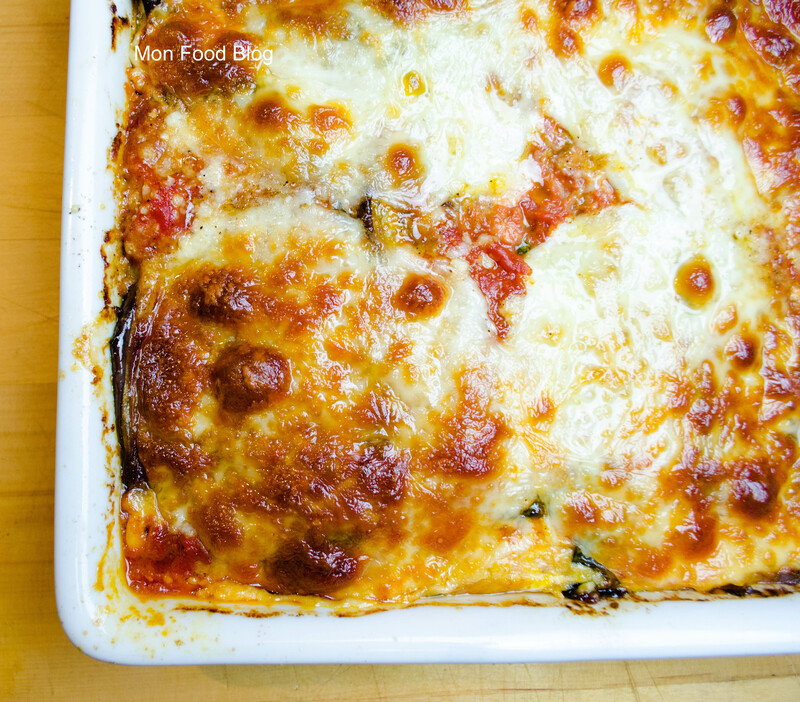 When making the tomato sauce, keep in mind that there is quite a bit of cheese in this dish, and that the eggplant is sprinkled with salt to draw out some liquid and some bitterness. I prefer doing this because it will tighten the flesh of the aubergine, and it will not absorb as much oil when you cook it. Aubergines nowadays are not as bitter as they were a decade ago and you can omit this step altogether. The egg in the dish helps to give structure and provides a rounder flavour. Don’t be tempted to leave it out! 1. In a small saucepan, cook the garlic and hot pepper flakes in the olive oil over medium-low heat for about one minute. 2. Add the tomatoes, crushing them with your hands as you drop them in, along with a glass of water. 3. Add the bay leaf, oregano, salt and pepper, and cook, uncovered, for 20-25 minutes, or until the sauce has thickened. 4. Add the butter, correct seasonings, and set aside. 1. Peel the eggplant if you wish (you don’t have to), then cut it lengthwise into 1/2 inch (1 cm) slices. 2. Season one side lightly with a bit of coarse salt, put in a colander and leave to drain for 30 minutes, putting a weight on top. 3. Rinse the eggplant with abundant cold water and pat dry with paper towels or a clean dish towel. 4. Brush both sides of the eggplant slices with olive oil and spread the slices on a cookie sheet covered with parchment paper. Working in batches, put at the bottom of the oven and cook until the eggplant starts to brown on the bottom, about 20-25 minutes. Turn the slices over and continue to cook for another 10 minutes, or until it is done. You can cook the eggplant on two cookie sheets, one at the bottom of the oven, one in the middle. If you do this, switch the cookie sheets after the first 20-25 minutes so that they brown evenly. 5. Transfer the eggplant on paper towels and let drain. 1. Cover the bottom of a baking dish with a bit of tomato sauce. 2. 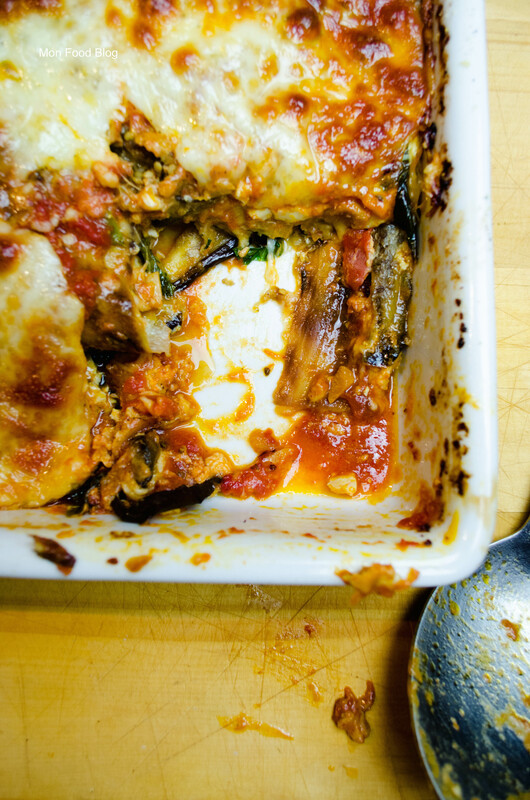 Add one layer of cooked eggplant, season with black pepper, and put about one tablespoon of tomato sauce over each slice, spreading the sauce with the back of the spoon. Do not put too much sauce. 3. Tear the basil leaves and sprinkle a few on top of the sauce. 4. Add about 2 tablespoons of parmesan over the first layer. 5. Add about one third of the egg and distribute it evenly over the layer. 6. Top with the mozzarella or provolone. 7. Continue building the dish in the same manner until you run out of ingredients, finishing with the mozzarella or provolone. 8. Lower the temperature of the oven to 350°F, and bake the eggplant for about 30 minutes, or until bubbly. 9. Let it rest 10-15 minutes before cutting. Serve with a fresh salad or with grilled meat. An Italian classic! Some times we fry the eggplants, but like this is a little bit lighter :-) A wonderful dish for the festive season! You are so right! What a wonderful dish to serve guests for the Holidays!